Our bodies depend on water and every cell, tissue and organ depends upon water to operate efficiently. The body uses water to maintain temperature, remove waste, and lubricate joints and water makes up for more than half of our body weight. When it comes to hydration water is the best option. There are other fluids and foods that can aid in providing water needed. Fruit and vegetable juices, milk,sports drinks can contribute to the amount of water you should get each day. Limiting caffeinated beverages is recommended as caffeine may cause fluid shifts from body tissue to intestines promoting elimination and some to urinate more frequently, create anxious or jittery symptoms. A moderate amount of caffeine, 200 to 300 milligrams, equivalent to 2 to 4 eight-ounce cups of a caffeinated beverage per day. Water rich foods such as watermelon, tomatoes and lettuce can aid in warding off dehydration. Is your body low on water? You lose water each day when you go to the bathroom, sweat, and even when you breathe. Water is lost from the body even faster when combating an infection or being out in the hot weather. Individuals exercising in hot weather, ill with a fever,or vomiting and having bouts of diarrhea are at a higher risk of dehydration. The elderly are also at a higher risk of dehydration due to decreased senses that contribute signaling the body of the feeling of thirst. When the lost fluids are not replaced, dehydrated occurs. Offering fluids frequently to older individuals will aid in maintaining hydration. Monitoring urine color during the day is another way to know if the body is well hydrated: When the urine is colorless to a light yellow in color hydration is being maintained. If the urine is dark yellow in color, the body is in need of additional fluids. How much is enough? The average daily intake required for a healthy body is 8 eight ounce glasses of fluids a day. There are various circumstances for each individual. Individuals diagnosed with heart conditions (i.e., Congested Heart Failure, etc.) may be instructed by their health care providers to limit fluids in their daily diet. Patients diagnosed with altered kidney functions will also be placed on their own daily fluid intake program. Discussing your daily fluid intake, with your physician or professional health care provider, is suggested. It can be very difficult to recognize dehydrated, especially in the elderly. Preventing dehydration by drinking plenty of water, and following your health care providers recommendations, can prevent dehydration. 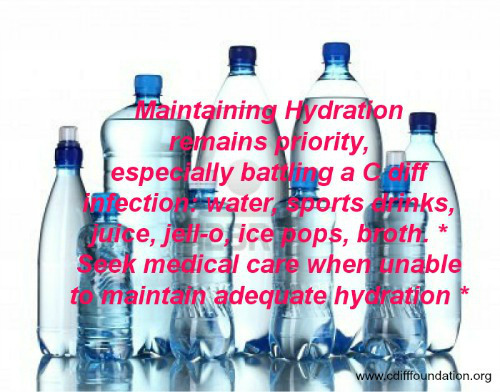 If you are unable to maintain hydration for any reason, seek medical attention as soon as possible. Contact your Primary care physician to report symptoms and/or visit a local clinic/hospital for medical care. This entry was posted in Nutrition and tagged c diff, C diff foundation, hydration, Medical Nutritional Therapy, Nutrition on July 21, 2013 by cdifffoundation.